Are Liverpool trying to make Jurgen Klopp the next Ferguson or Wenger? Klopp’s contract extension illustrates Liverpool’s willingness to wait for success. A deflated Jurgen Klopp after this year's Europa League final. LIVERPOOL’S PLEDGE TO stick with Jurgen Klopp until 2022 may have come as a slight shock to some people. Granted he has been adored by Kop fans since replacing Brendan Rodgers, and his reputation still bears the glow of success he enjoyed while at Borussia Dortmund where he won the Bundesliga twice as well as the DFB-Pokal. But just nine months since his arrival at Anfield, he hasn’t had the time either to prove that he will be the answer to Liverpool’s repeating dilemmas or otherwise. There may, however, be some logic behind the contract extension as Liverpool continue to strive to land their holy grail in the shape of the Premier League title. Since the introduction of the Premier League in its current format back in 1992, Liverpool have won the FA Cup, the League Cup, the Community Shield, the UEFA Cup (now Europa League) and the hallowed Champions League Trophy. The one that has eluded them for so long is the one that every fan, director, coach and player understandably craves. Over the last 25 years, Liverpool have drifted dismally from manager to manager in the hope of conquering the league that has been a source of frustration for them since its establishment. Their name, however, remains absent from the its roll of honour. Souness, Evans, Houllier, Benitez, Hodgson, Dalglish and Rodgers all tried and failed in their quests, none of them lasting for a period of six years or more. When you think of managerial success in the Premier League, there are two names which immediately spring to mind. The first is Alex Ferguson. Despite his inimitable success, the start of Ferguson’s tenure as Manchester United manager was anything but glorious. The Scot finished 11th in his first season at the helm before reaching second in the table the following season. He was unable to build on this improvement, falling to 11th and 13th in his next two seasons in the job. It took the former Scotland manager a total of seven seasons to land the title — the same time-frame Klopp has been offered, coincidentally. Success was slow to arrive for Ferguson but once it did, it initiated a glorious era that continued over the next 20 years. Liverpool appear to have ambitions of achieving Fergie-esque success and have displayed a sense of understanding of what needs to be done in order to achieve this. 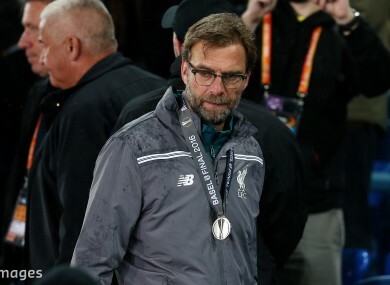 Patience and perseverance is a prerequisite and placing faith in Klopp to unearth long-awaited triumphs over a longer term illustrates their approach. But this is not a one-off trend applying solely to Ferguson and Manchester United. Arsene Wenger’s name is another which jumps to mind when it comes to Premier League success. The Frenchman landed the title in just his second season, capitalising on United’s complacency. They bucked the trend slightly, winning the league with one point to spare, but it took Wenger until his sixth season before he landed the Premier League again. The “Invincibles” of the 2003/04 season took Wenger a number of years to develop and it is something which is bound to have been playing on the minds of those in charge at Anfield as they decided to give Klopp a contract extension. Look further back before the foundation of the Premier League and Bill Shankly, Stan Cullis and Matt Busby took five, six and seven years respectively to first deliver success to their clubs before driving on to more success with Liverpool, Wolves and Manchester United. Klopp isn’t the first to be given a lengthy time period to achieve success at Anfield; Houllier and Benitez also enjoyed periods lasting just under six years in charge. Houllier, who never really threatened title winners in his time at the club — although he did finish second in the table — was given a significant period of time to try and succeed but eventually fell well short of reaching past honours. There were some glimpses of hope during the Benitez days as he finished second in his fifth season after bringing European success to the club early in his Liverpool career. A disastrous 09/10 season dashed all hope that he might be the man to end the league drought and he left the club by mutual consent in June 2010. The decision to stick, rather than twist, with Houllier and Benítez for long terms hasn’t and shouldn’t deter Liverpool from seeking long-term managers. The prospect of continuous success, akin to that of Wenger’s and Ferguson’s, has aroused the Reds’ eagerness to return to the days of being a sustained force in English football and their resolution to the current drought is strikingly clear. A long. industrious journey now begins for Klopp at Melwood, and anything but roaring success is sure to be deemed a failure by those faithful who wait in hope. Is this how Jose Mourinho’s Man United side will line up in the new season? Email “Are Liverpool trying to make Jurgen Klopp the next Ferguson or Wenger?”. Feedback on “Are Liverpool trying to make Jurgen Klopp the next Ferguson or Wenger?”.